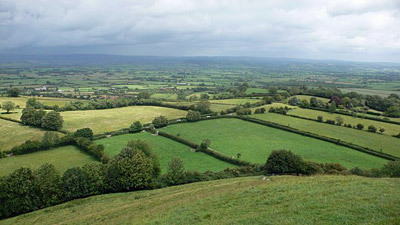 Somerset is an beautiful county of classic English rural countryside, filled with lush rolling hills, gorges and caves. Somerset has a vast agricultural area of some 3000 farms, producing two of its most famous products: Scrumpy cider and Cheddar cheese. It boasts 20 historic market towns, countless chocolate box villages and two of Britain's most beautifully cities; the architecturally stunning Bath in the north and the small but spectacular Wells, in the middle of the county. The central plain is flat, known as the Somerset Levels. The dykes that drain the levels are known as 'rhines'. This flat area is broken mid-way by the ridge of the Polden Hills. The plain is also bounded by the Mendip Hills in the north-east, which are cut by numerous gorges, the largest and best known being Cheddar Gorge. The steep Quantock Hills form the western border of the plain and further west lies the moorlands of Exmoor, with the Brendon Hills projecting eastward. South of the Quantocks lies the fertile Vale of Taunton Dean. "And the people of Bath", continued Cain, "never need to light their fires except as a luxury, for the water springs up out of the earth ready boiled for use." Cheddar Cheese - Britain's premier strong flavoured cheese. The ideal choice for a ploughman's lunch or traditional cheese on toast. Scrumpy - a strong traditional British cider. Sally Lunn cakes - well risen with yeast. In the early 19th century they would be cut in slices, toasted and buttered, then sent out to all the elegant tea parties of the neighbourhood. First recorded in 1015 as Sumaersaetoncomes. Its name comes from the Old English, meaning 'dwellers round Somerton' (a farmstead tended during the summer but not occupied in winter).